In AD 43 Britain was invaded and conquered under Claudius. 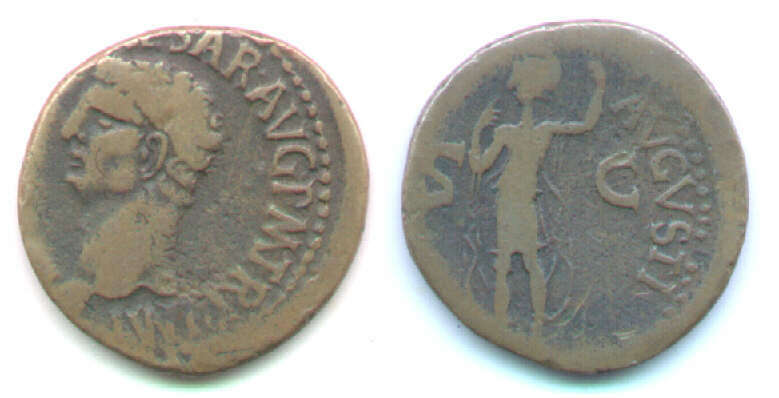 Apparently, thereafter the demand for coins far exceeded the official supply and locals began minting imitations of AE prototypes of Claudius. 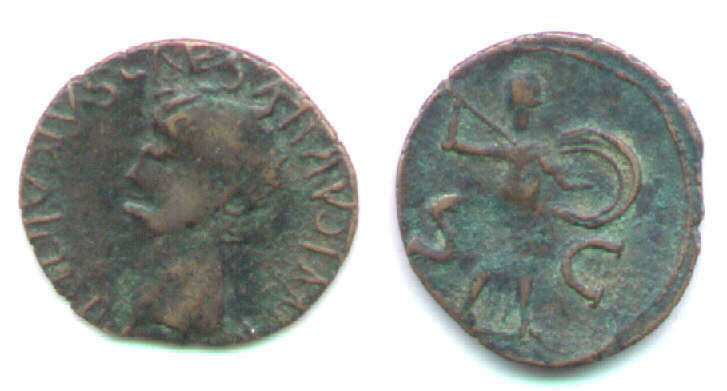 The most commonly imitated prototype is the copper as with Minerva right brandishing spear and shield reverse seen to the right. 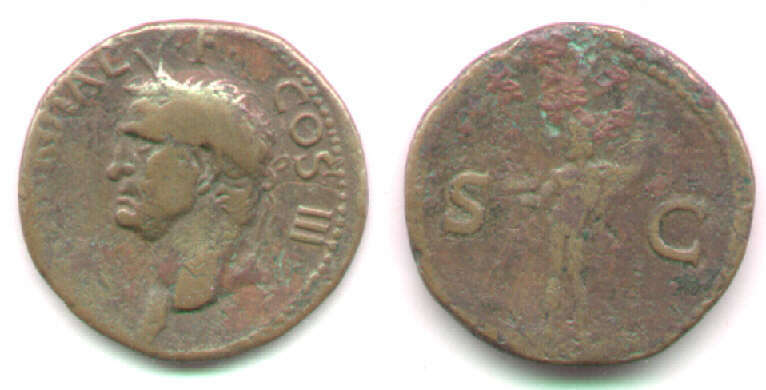 A second imitated type, the SPES AVGVSTA sestertius, in discussed below. Most British imitations of AE must be regarded as "money of necessity" rather than imitations for profit. Only a small fraction could be deceptive; many are obviously much smaller, lighter, and cruder than the official coins. But they seem to have been commonly used and some were even validated by countermarks. 28 mm. Die axis: 6:30. RIC 116. BMC 207. 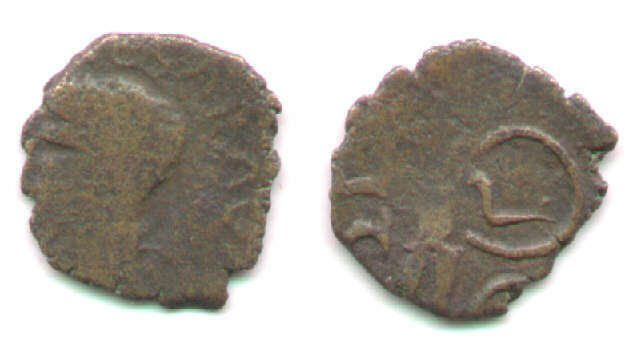 Struck c. 50-54. RIC I, 100, plate 16 says "weight peak c. 11.25 - 9.50 grams." Most of the imitations weigh distinctly less. Banti &Simonetti XV, p.70-136 has many imitations illustrated. The imitations here are of varying degrees of resemblance to the prototype. Could this be official? It is full size and full weight, but the heavy brow of the portrait makes it a close call. 26 mm. 5:00. 7.86 grams. Good style. Excellent lettering. Could almost be official and poorly struck, but for the light weight. /Usual reverse, "S" flat struck. 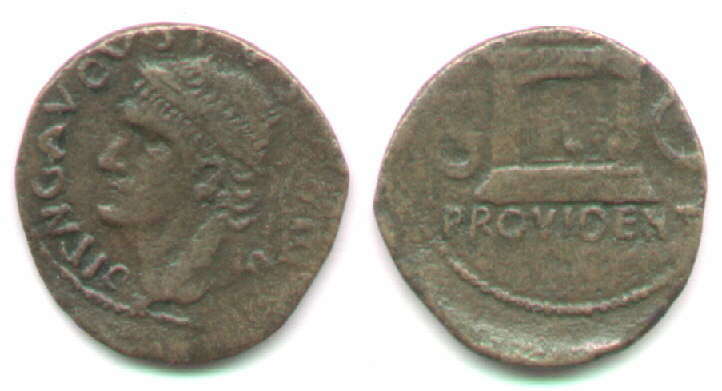 TI CLAVDIVS CAESAR AV[G] I... in irregular letters. The reverse is not far from the official style. Crude style. Only a hint of lettering. /"Minerva" seems to be rendered as a male. Obverse legend very crude with letter-like forms, but not real letters. 24 mm. 6:00. 3.93 grams. Thin flan. No legible letters, nose weak. /Clear Minerva, bold S C.
26 mm. 6:00. 5.64 grams. Small bust. Weakly struck. Well-formed letters. Good style. Edge shows no signs of casting. Close to offical style, but light weight. 26-22 mm. 9:00. 6.83 grams. Irregular style. Some legible letters. Much flat striking. /shield and "S" flat on reverse. 26 mm. 5:30. 5.62 grams. Head very crude, with a very weak face. (Lots of corrosion.) Traces of letters 1:00-5:00. Crudely sketched Minerva, with crude S C.
23 mm. 4:30. 3.93 grams. /Minerva's body flat struck, but shield bold. S C 2/3 clipped. 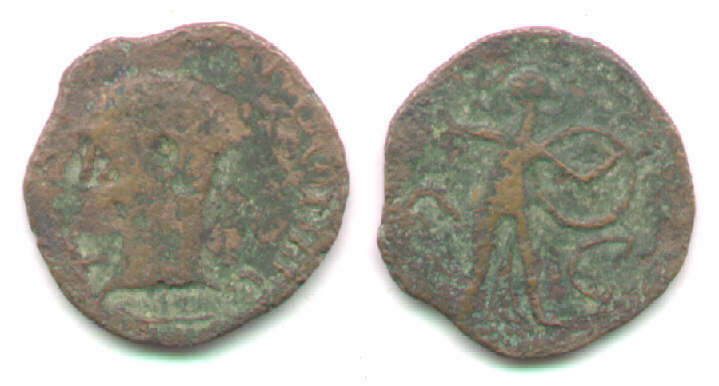 Reference: This piece is the plate coin in P. J. Casey Roman Coinage in Britain, plate 8.5. 24-21 mm. 6:00. 3.95 grams. Crude, thin sharp edges, porous, very corroded. /S C both clipped by edge of flan. The weight is much less than the 10-11 gram prototypes. 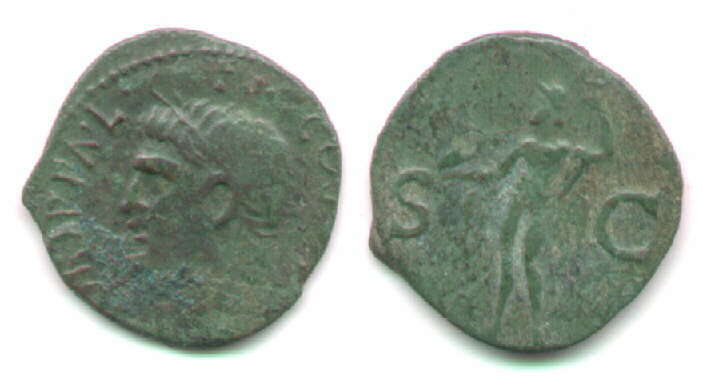 Good style Tiberius obverse. British find. 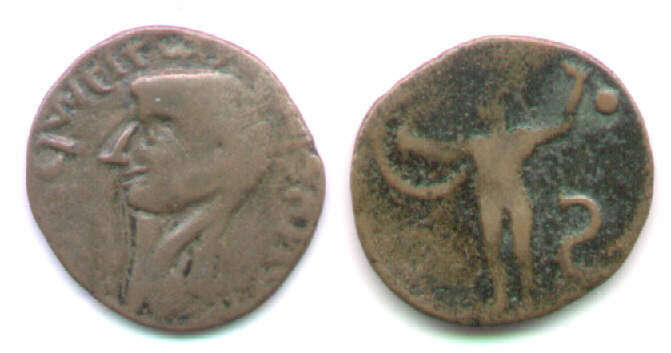 Prototype: Obverse of "ROM ET AVG" dupondius, BMC 575, see plate 21.4-5 "AD 9-11"
Imitation, reference: B&S IX p. 206 ff, #36 obverse; 371 is this type hybrid with different dies, p. 222. An as. 30 mm. 12:00. 10.41 grams. imitation: 27-25 mm. 6:00. 10.28 grams. Prototype LIBERTAS AVGVSTA Very low relief. Full weight, but a bit small in diameter. Protoype: RIC 97. BMC 145. 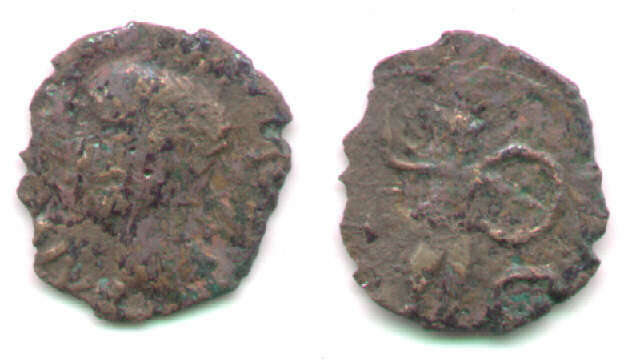 Struck AD 41-45 or 41-50. Three countermarked imitations, possibly from the Balkans. 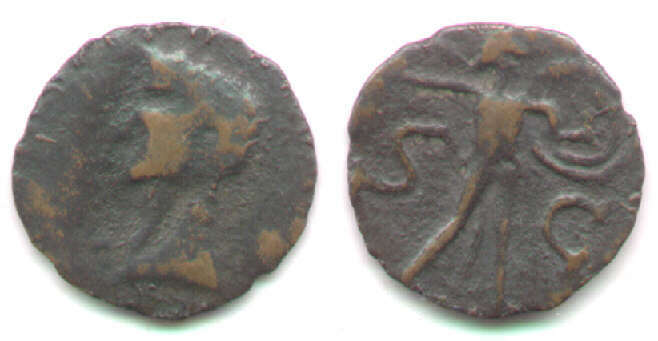 The countermarks serve to make unofficial coins officially acceptable, sometimes at a reduced value, as with the sestertii below which are marked "DV" to indicate the value of a dupondius. BON countermark. 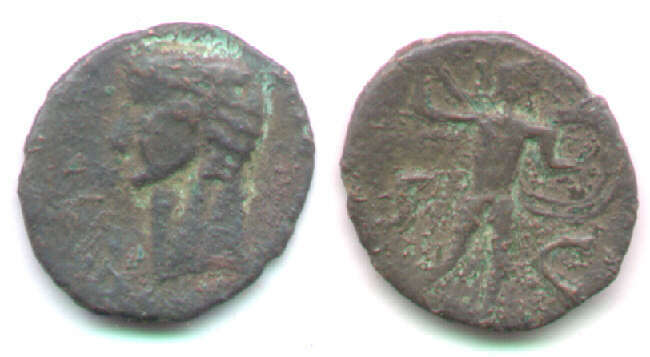 This coin may be from the Balkans, not Britain. Kraay, in Essays Mattingly, suggests the BON countermark may have been applied under Nerva or Trajan. 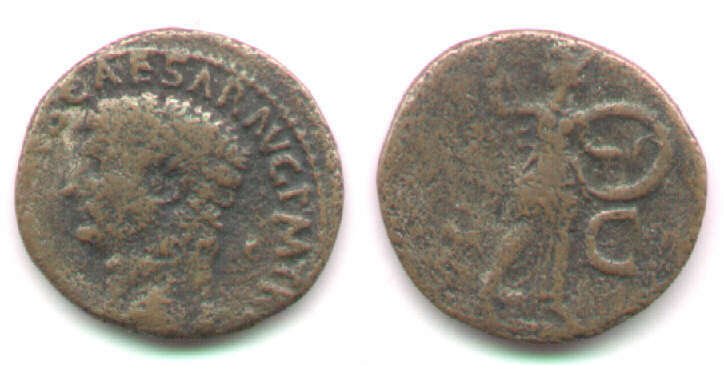 This coin is very worn, compatible with having circulated a long time. 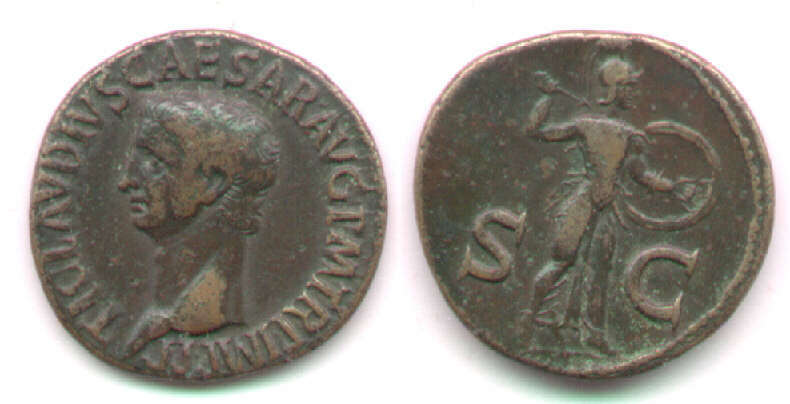 BMC 164, a sestertius, and 184, a sestertius, both imitations, have this BON countermark, but there are no photos. B&S 61/9 has BON countermark = Hunter I, 17.67 (7.87 g) with different countermark die. Countermarked "DV" which is not listed in BMC I and therefore probably not a western countermark, supporting the dealer's attribution "from the Balkans". Obverse legend almost all gone (or never there) but faint traces of "...R AVG PM .."
Reverse legend, if any originally, flat. Countermarked "DV" which is not listed in BMC I and which is coming to be recognized as from the Balkans. 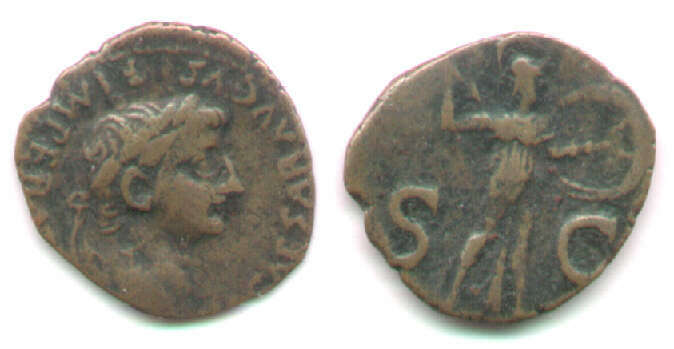 Obverse legend: ...CLAVDIVS CAESAR AVG ..."
Reverse legend weak, but visible: SPES AVGVSTA . 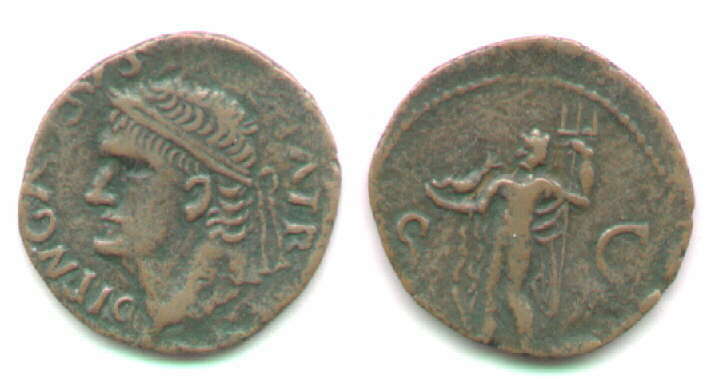 This type was copied in Britain, but not as commonly as the Minerva as. This site has no illustrations of British imitations of this type--the previous imitations are from the Balkans. Claudius imitation in excellent style. It is difficult to decide if this might be official. Official examples seem to have (weakly) barred A's. If this is truly an unofficial imitation, it is a remarkable one. /CERES AVGVSTA, Ceres seated left, veiled and draped, on ornamental throne, holding 2 grain ears and nearly-horizontal long torch. Prototype: RIC 94. See also RIC 110 of "c.50-54". B&S XIV pages 217-233. See 372 a "provincial imitation." See 361/1 for dotted throne parts. 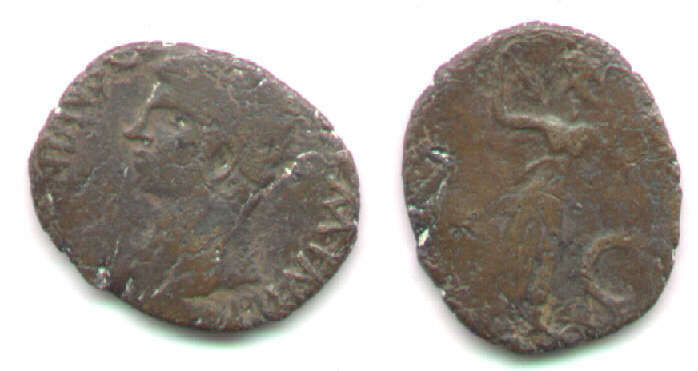 Obtained in Britain with a ticket calling it a "Romano-British imitation." Claudius as, possibly official, but a close call. AE28-27, as, 6:00, 10.57 grams. This piece is badly off-center, the portrait is of slightly "heavy" style, and the reverse figure looks primitive. But, the weight is right and the die-axis is right and the lettering is good. The diaphonous dress on Constantia is well done. All in all, I'll guess this one is official. /[CONSTANTIAE] AVGVSTI, Constantia standing left, heand raised to mouth. Reference: RIC 95, plate 16, page 127, of "AD 41 - 50(?+)". 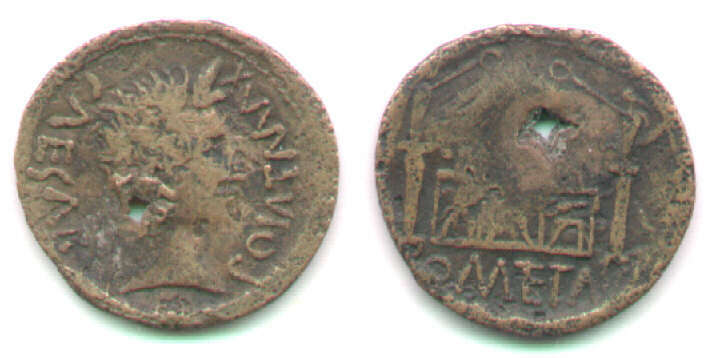 I have included this coin in order to recommend Banti and Simonetti's volumes called "Corpus Numorum Romanorum" which have pages and pages on every type of Claudius, including 27 pages on this type (in volume XV), with numerous imitations ilustrated in addtion to the numerous official examples. The line between "official" and "imitation" can be fine. Many British types are too crude to mistake for official coins, but some pieces (like this one) are cruder than the best official examples but not so crude as to make it easy to decide. I would not be surprised if some other experts pronounced this one an imitation. Leaded AE26, as, 4:00, 6.54 grams. Flat strike further defaced by a square piercing from the reverse side, perhaps by a nail. /ROM ET AV [sic] (It should finish AVG) beneath altar of Lugdunum dedicated to Rome and Augustus. Ref: (old) Sear 510. Sear 1690. RIC 230 "c. 15 BC - after 10 BC." BMC 550, "10 - 6 BC(?)". Banti & Simonetti, volume VI, pages 103-116. "11 BC - 8 BC at Lugdunum." Most examples are c. 11.5-9.0 grams. The lead component can been seen in the piercing (looking at the coin itself, if not the scan). The coin is somewhat smaller in diameter than its prototype and a bit too thin, which explains why it is so underweight for the type. This alone condemns it as false. In addition, the reverse style is a bit off and the exergual legend is incomplete. Perhaps the piercing was to deface the coin when it was detected as false. Crude obverse legend -- better reverse legend. 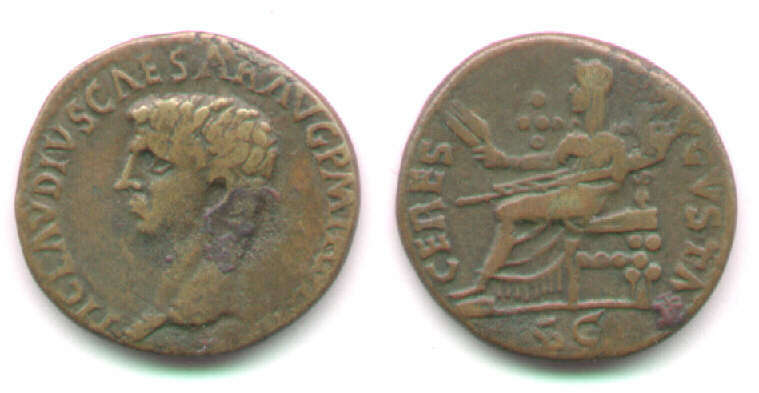 Reverse prototype RIC 80, page 99, with portrait of Agrippa from Gaius (Caligula) 58. Reverse prototype B&S VI page 88f, barbaric pieces not like this, p.98-101. 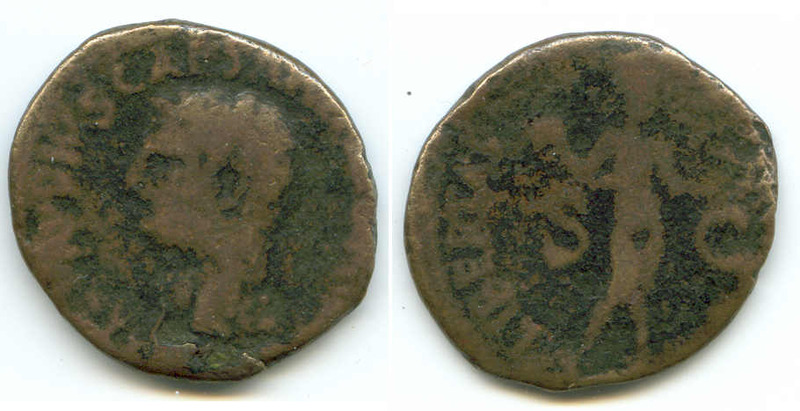 Obverse B&S VIII pp.90-99, with imitations p. 100-102-104, but not this reverse. The next coin is obverse die-identical, which is very unusual. 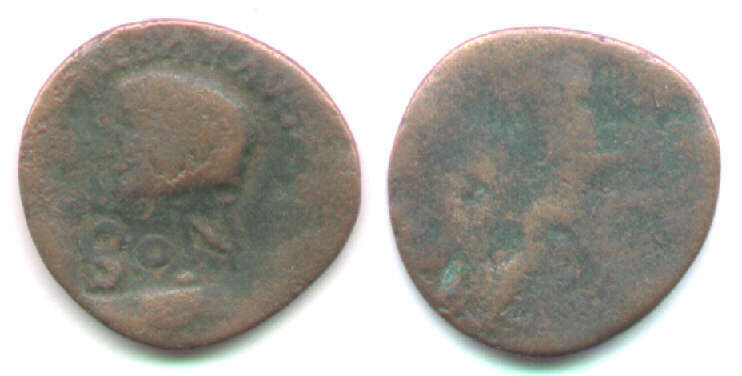 Obverse die-identical to the previous coin. 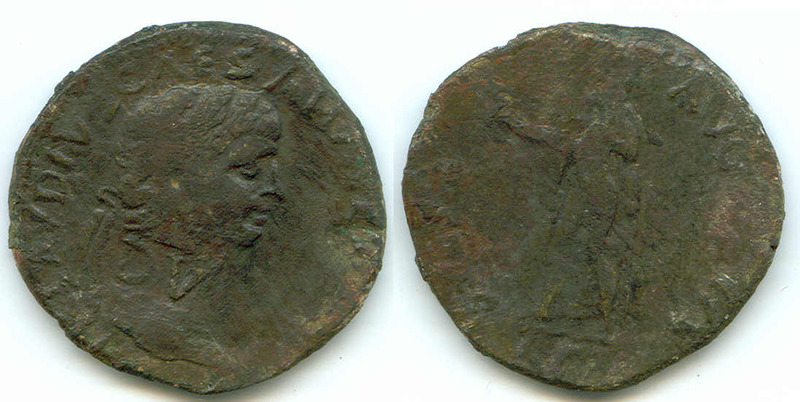 However, this one has the usual Agrippa reverse. RIC 58, page 112 comments in note 58, "many hybrids and imitations exist, in both cases extending over a considerable period of time." B&S VIII prototype p. 83-99, with imitations p.100-1, 14 pieces but none very similar. RIC Gaius 58, page 112 "AD 37 - 41." (The first edition of RIC had this type under Tiberius.) BMC Tiberius 161. B&S VIII pages 84ff. B&S VIII p. 83-99 for the prototype, p. 100-1 for imitations. Continue with other 1st and 2nd century AE imitations. Return to the Table of Contents page on Roman imitations.